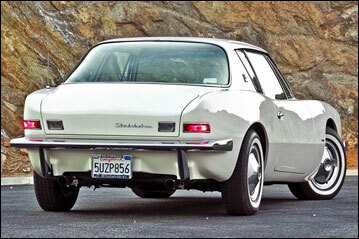 Raymond Loewy included a "pinched waistline, as on le Mans-type racing cars" as one of the mandates for the Studebaker Avanti's design. This approach to auto body design had already been labeled the "coke bottle curve" for its resemblence to the classic coke bottle. Raymond Loewy admired the Coke bottle design enough to state that "The Coke bottle is the most perfectly designed package in the world." Raymond Loewy Associates worked for Coca-Cola from the 1940's through the 1960's. Loewy did not design the original Coke bottle, but he did associate himself with it. Loewy did create designs for the Coca-Cola Company. He applied for patents for his designs for a Coca-Cola "refrigerator" (a standing cooler) in 1945; an "ornamental design for a truck body" in 1946; and a beverage dispenser with an "ornamental design" in 1946. He was responsible for designing the Dole Delux Dispenser in 1947, as well as the Dole Super Dispenser in 1951. Loewy Associates did redesign the Coke bottle in 1954. 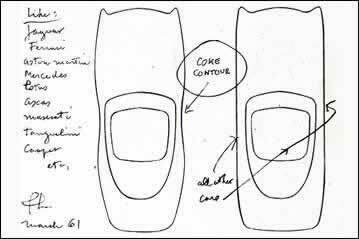 Loewy sketch dated March 1961 comparing the "coke contour" with "all other cars." From the rear the coke bottle shape appears in the side contours of the Avanti. The curved and indented side of an Avanti suggests the shape of the familiar coke bottle.